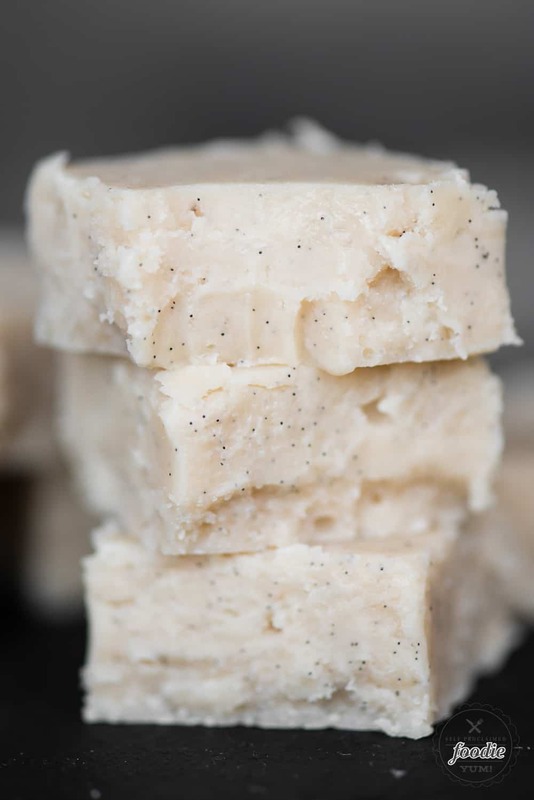 Old fashioned homemade vanilla fudge, made with real vanilla beans, is a sweet bite sized dessert that’s perfect for a holiday treat! 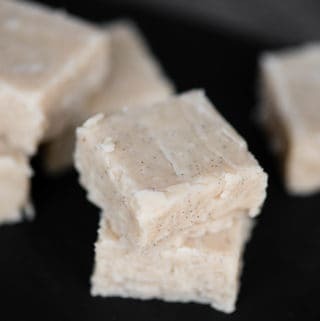 This homemade vanilla fudge combines the goodness of butter, heavy cream, sugar and real vanilla beans to create an irresistable bite sized dessert. I always make some kind of fudge during the holidays, and this Vanilla Fudge did not disappoint! This sweet fudge wasn’t as easy as my Five Minute Microwave Fudge, but it is certainly worth the effort. It really was pretty simple to make. Don’t let boiling sugar scare you! How do you make vanilla fudge? 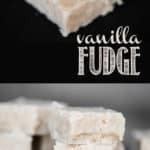 There are a ton of different fudge recipes out there. There’s really no right or wrong method. I’ll explain how I made this version of vanilla fudge below. 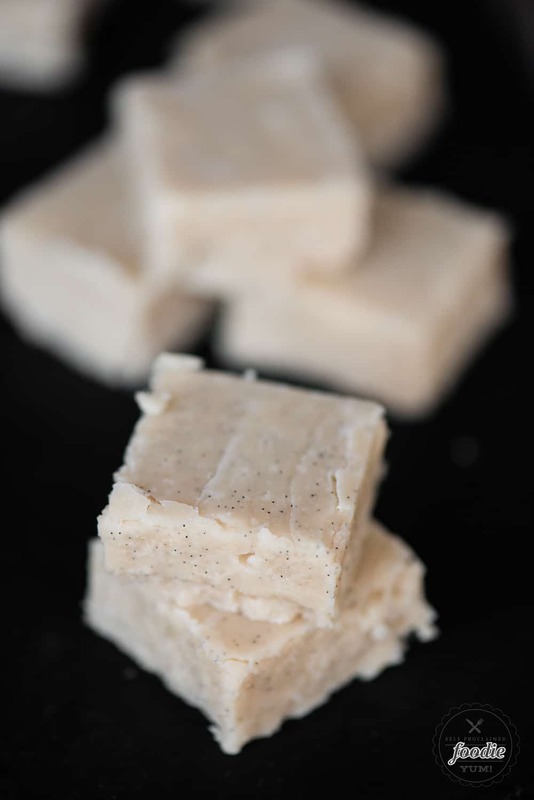 The main process behind this vanilla fudge recipe is to cook the ingredients on the stove. You will do this until it reaches the soft ball stage of 238 degrees F. Any lower and your fudge might not set. Any longer and it will be too hard. Invest in a good candy thermometer. While the fudge is boiling, you do not stir it. You can, however, use water to wash and sugar that is crawling up the sides back down into the pot. Water boils at 212 degrees F and then it turns to steam. Because the fudge gets much hotter than that, all of your water will evaporate before the fudge hits it’s ideal temperature. I add split vanilla bean pods to the mixture. You will remove them before the fudge begins to set, but it definitely pays in the flavor department to keep the pods in as long as possible. Once you remove your hot vanilla fudge mixture from the stove, you’ll pour it into a bowl with a bit of butter. Again, you won’t stir this mixture. You’ll allow this to cool quite a bit, then you’ll stir it well, and finally you’ll spread it into your pan until it is fully cool. 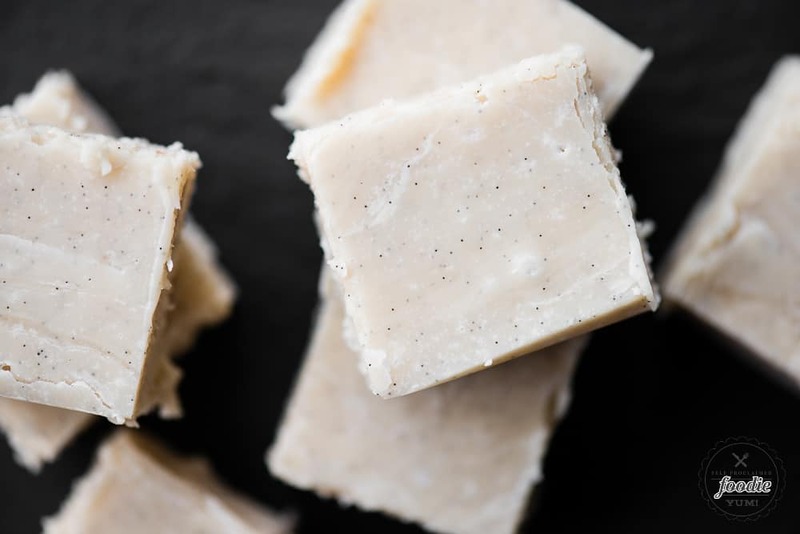 Old fashioned homemade vanilla fudge, made with real vanilla beans, is a sweet bite sized dessert that's perfect for a holiday treat! Set cold tablespoon of butter in large bowl (glass or non-reactive metal) and set aside. 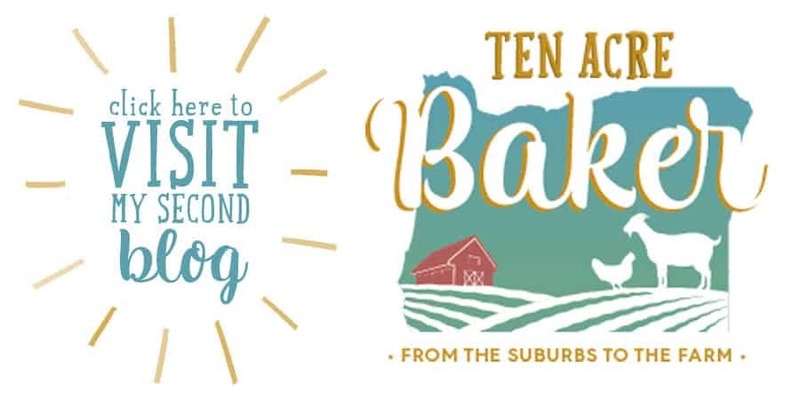 Line a 8-inch square baking pan with foil lined parchment paper. Lightly grease the parchment side with butter. In a medium sized heavy saucepan, combine remaining ingredients. Cook over medium low heat, stirring constantly, until the sugar fully dissolves. This will take about 10 minutes. Increase heat to medium to bring mixture to a boil. Do not stir. Insert a thermometer. Allow mixture to continue bubbling. Occasionally wash down sides of pot with water using a silicon brush to avoid crystals from building up. Cook until the fudge meets the soft ball stage of 238 degrees F. This should take about 10-15 minutes. As soon as the fudge hits the soft ball temperature, pour it into the bowl with the tablespoon of butter. Do not scrape the bottom of the pot as there may be over cooked parts you do not want in your fudge. Do not stir the fudge when it hits the bowl. Simply allow it to cool undisturbed with the thermometer in place. When the fudge reaches 110 degrees F, start to stir the mixture. After about 5 minutes of stirring, the fudge will lighten in color and start to lose it's sheen. Remove vanilla bean pods and pour into prepared pan. Quickly spread fudge to make an even layer, as it will set quickly. Allow to cool in pan at least one hour. To cut, lift the foil lined parchment and transfer the fudge to a cutting board. Cut into 36 bite-sized pieces. Store in an air tight container at room temperature. Fudge can also be frozen for longer storage.